Hi. I have been doing mailling for a few months as a school project. And I have used this site as the primary source of modern mailling. But before i wrap it all up, I have a few questions. Both for this project, but mostly planning for next year. About this site. Has this site/community existed for a long time? Is this considered to be THE site for the art form? And is it still going strong, or is the days of glory in the past? Is there any other noteworthy site on the topic? Has anyone made some famous/high profile artwork, or otherwise worthy of stalk.. Er... Following? I'm mostly into riveted Mail, is there some people, site or works on this that is a must to know? Message traffic on this site has slowed a lot over the past twelve to eighteen months. I couldn't speak to referring to weave tutes or galleries or articles. When first I began reading MAIL, it was one of three large mailler sites. Now there are two -- this one and The Ring Lord's Chain Mail Forum. That one too the posts traffic is considerably reduced. Was mail crafting a bigger thing five years ago? -- I don't know. The third website was another business-sponsored one like The Ring Lord -- supplies and wire etc. Charles DeCordené left the business and his site faded away. We now have left one site connected with a mailling-supplies business and one not. I suppose there are blogs and such, and jewelry maillers showing their wares on a page of their own. Commercially, there are a few small producers scattered here and there. Part of the biz is selling and distributing Indian-made mail, the product of one small village where the manufacture was sparked by Steve of Forth Castle, or SoFC. Gordon Osterstrom's Welded Chain Mail site sells what might be called sport mail, and has connections with Vietnamese producers. Mail's labor intensiveness means building medieval or faintly medievalish mail by hand has to go where hourly labor is very cheap. There is machine mail, also called butchers' mail and shark mail for making shark suits of for divers. This is characterized by very fine links, welded very smoothly and of stainless or aluminum wire. Whiting-Davis or AZON companies being examples. This sort of mail is what they built Frodo's fabulous mailshirt out of for the movies, plus putting some nernies on it and processing in a shimmer.too costly. There are some Europeans in the reenactment community who do some mailmaking or offer tools. I started mailling somewhere around the end of 2000/the beginning of 2001, and I thought that the first incarnation of MAIL started a few months later. Going through my email archives, the earliest message I was able to find from MAIL was on 2002-03-25, which was the kickoff for "...the new automated system for M.A.I.L. Now it's chocked full of crazy things that will, hopefully, make M.A.I.L. a greater resource for furthering the art & industry of maille." There are a number of maille groups on Facebook (and I'm sure other social media platforms as well), and I'm sure that they have cut into the traffic on this site. There's a bunch of little places scattered around. A lot of the original founders are disappearing, with not too many new people filling in the holes. Also with respect to riveting, I suggest poking around in the articles area as well on this site. Those that wrote said articles may be worth searching on the forums for older posts or contacting directly. I would have to say yes "THE site" imo, if only because i like the network here better than other sites, though i still can't make the search feature cooperate. Wow. Thanks for the reply people And sorry for my bad Englich I'm not native, on a phone, in a car, on a bumpy mountain road. Is there some standard on how to record weavs, like nitting patterns or something? I will nees some way of writing things down. There are also a few very active Facebook groups. Uploading photos may not work on Mobil. File sizes are limited so the message boxes size and line up properly. Though there maybe an app that does it for you. As for writing down patterns its tricky drawing relations ships in 3d dealing with multipul objects at once. CGI works but many tutorials just use quality images and contrasting ring colors. As a sometime linguist my own self, I say you do a good job of upholding the high Scandinavian standard of English-speaking, which had always so impressed me the few visits I made up there when I was in the US Navy... I came up Oslofjord aboard the battleship Iowa right around 20 September 1985. We had to make it all the way up into Oslo harbor once we entered the fjord, as we could not possibly have turned the Iowa around in the fjord passage itself. Only in the harbor would we have room to get the ship pointed south again. I wonder what the people living along Oslofjord thought of the show as we passed -- Oslo doesn't usually get battleships. English being the favorite second language up there, I imagine it encourages lots of tourist traffic over into the British Isles for foreign travel! If the verbs get a little erratic (and the notorious English spelling also, can't forget that!) -- oh well. You manage a fluency of expression in English that not many can; you'll do fine around here. Was not Hercule Poirot both un peu erratique en anglais -- and fluent? You're in good company. It's the Forum traffic which is down.. This is reflected all over the web, as people move to Social Media/Things they have apps for/lose attention spans/etc. Thanks. I probably speak English better than most Norwegians. I have worked at Romsdalsmuseet, a folk museum in Molde, as a quide for many summers. I also have had a Finnish girlfriend for a year, so I speak a 50-50 mix of Norwegian and English. With a accent. Most Norwegians speak good English. So connections to England, and to a certain extent North Dacota and Minesota, Are strong. But the spelling is a challenge. Often I need to change what I'm planning to write, due to not knowing the spelling of the words. Concering your trip to Oslo. Norwegians are fascinated by boats and ships. Often waving to big Cruise ships, or old veterans. So the Battleship Iowa would have attracted a lot of people. I know it was a fuss when the air carrier USS Saipan was in Oslo to celebrate our independence from Sweden. This is my fist work. A bracelet. Keep guilting us and maybe I'll finally get around to writing a few articles. Seriously, get mean. Edit: The Images won't show. What whave I done wrong? That being said, this website doesn't scale them. So your images would appear giant with scrollbars. Speaking of articles... usage of image tags seems to be a FAQ. Maybe someone should write a usage article with examples. this is the go to site for chainmaille weave library. there is no other database of weaves that comes close to documenting all of the different chainmaille weaves. i have a personal library of 260 documented weaves and this site has almost 1400 now. people come here for free information. they browse the library, see if their experiment is a new weave, look up a tutorial, read an article, etc. very few people come here to communicate though. i'll keep quiet on why i think that is - everyone here already knows and it only causes trouble. there are many groups of chainmaillers that do different things. there are the suppliers, trl is at the top for this. no one even comes close to the volume of sales that they do. but, they aren't known for their finished chainmaille. they make chainmaille for movies and some special interest, but there are others that are more innovative. there are the machine made chainmaille suppliers. in my opinion, mailletec industries heads up this group. then, there are the armorers. this is a small group that focuses on making costume and functional armor. armorers tend to use e4 almost exclusively and don't have a vast knowledge of other weaves. they tend to be super knowledgeable about the history of chainmaille and are really good at manipulating e4. then, there are jewelers. this group is the largest and still growing. these people make jewelry out of the many chainmaille weaves. 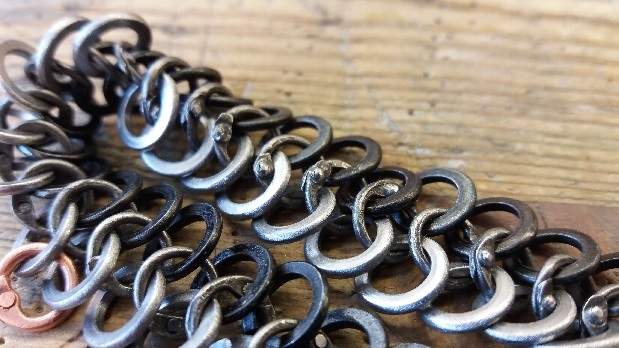 this group is 80-90% newbies and is made up of over 10,000 individuals excited about making their own chainmaille business as artists. they are the dreamers and the fashion consultants of the chainmaille world. they know a lot of different weaves, but tend to not know the history or the armor side well. this group is responsible for the growth of the supply industry. they buy tons of rings collectively, most of which never get used, lol. their main meeting place is on social media. there is a group of chainmaillers that i don't know well and they produce costume chainmaille for really cheap. they are usually people/business in third world countries using slave labor. they are the reason that the armorer group is small. of course these are generalities and there is much crossover between groups. i don't mean to pidgeon hole anyone. it's just my view on things. Nice job on the bracelet. 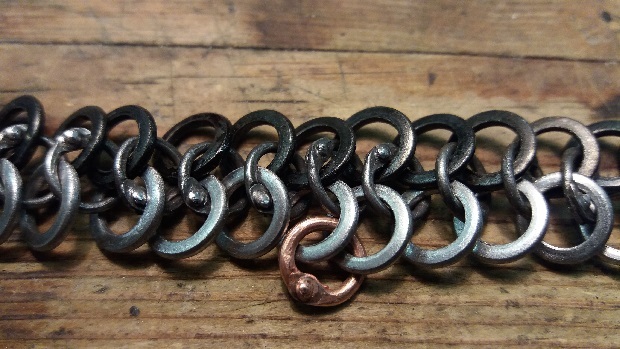 I am not an expert on riveted maille, but your work looks nice. 1) The weave library. There is no where else on the web that has such an in-depth collection of weaves. There are a lot of discussions as to what constitutes a weave, whether something is a weave or a modification or an artistic choice, and a lot of weaves that probably will never see the light of day--but that's all proof that this database is simply insanely comprehensive. Such issues are edge effects, comparable to issues with defining species in biology, and only really arise once you get enough data to realize there ARE edges. 2) Inspiration. I sometimes find myself clicking randomly through the gallery, because that's how you find some of the best inspiration for new projects out there. There are a tremendous number of highly creative folks here, and you'd be surprised what you find. 3) The community. I may not participate too much, but this is one of the few places on the web where the community seems genuinely willing to help newbs. If you have a question, most of the time the responses will be both helpful and polite, which is a rarity.